K jokes that I must be an alien because I’m allergic to practically everything on the planet. When I was a baby, I developed asthma. I was obviously still quite sickly because then the doctors figured out I was allergic to pets as well – and all the other regular allergen-inducing elements like grass, dust, house mites, pollen, people, walls, TV, water and being alive. Okay okay I’m exaggerating a bit, but I was a pretty allergic kid, and I continue to be a pretty allergic adult. Often when I emerge from my (piping hot) showers, I’ll have a rash on my face, neck and upper body, a bit like itchy bites. If I swim in the sea, my body breaks out in tiny red dots from head to toe – tiny, raised red spots that take anything from thirty minutes to a couple of hours to disappear. Friends, unable to contain their amazement/mirth, have even photographed it. When I visit my sister, she gives me an allergy tablet as soon as I arrive, because they have two dogs and within minutes I’m a sneezing, snotty mess. Right now, as I type this, I look like I’m deep in the throes of influenza – the kind you read about in Chaucerian tales, which wiped out thousands of people because of poor sanitation and rats and the fact that no one ever bathed (I swear I bath). My eyes are red and puffy and I have thick dark circles below them. 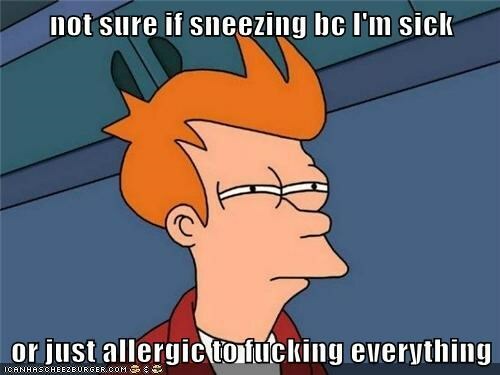 I have no idea why this is – I simply started sneezing a few hours ago and haven’t stopped. I did open the windows of our apartment, and outside there are some trees, so it could be that. A cat could’ve walked past our front door. A cat could’ve thought about walking past our front door. It could be any one of a million things. My research into autoimmune disease, and the time spent talking to nutritionalists, has made me realise that many people with IBD or other types of autoimmune diseases often display many allergies/intolerances, and also may exhibit symptoms of more than one autoimmune condition. For me, it’s asthma, eczema/psoriasis (mild and never properly diagnosed) and dry eyes – and of course ulcerative colitis. I’ve read many blogs posts by people who also have multiple autoimmune conditions so it seems to be pretty common. Oh and I’m lactose intolerant (and I’m sure I’m forgetting a few more as well). I’m not trying to draw any conclusions – you’ve got the Google doctors and scientists for that. I’m more just musing out loud. And wondering how the hell I’m going to get it together to look half-presentable for the show tonight. My favourite drag queen can’t see me looking like I’m coming off a 36-hour heroin binge. Quick-fix solutions for puffy, panda eyes?? Eeeep!